Soft and nourished skin, plump volume with elegant radiance. Who doesn’t love and wish to have such graceful beauty! I know every woman does. Now, you will be remembering the faces of all lovely ladies whom you adore and start doing predictive calculations for what they do to look so charming? Carbon Peel or popularly known as “Hollywood Peel” one such “magical” treatment which provides that fairy- soft texture, and eternal glow. (and you thought charming looks of Hollywood celebrities was only due to make-up) Yes, many of the celebs prefer to go for the carbon peeling before their visit to the red carpet, as it gives instant brightness and plumping, with almost no to minimal downtime. The procedure entails, a carbon paste being applied evenly on the deeply cleansed skin and it is left to dry out. The eye area is properly protected from the pack. The carbon particles find their way to your oil gland and help in decreasing the oil (particularly good for acne), further this carbon is heated with a “genesis mode” of the laser which also helps in heating the collagen in the deeper layers of the skin and hence providing a firming effect. Further, the “Toning mode” is applied next which blasts the carbon particles of the face and in doing so, takes away the dirt and dead skin along with it leaving your skin perfectly and deeply cleansed. Your skin gets energized quickly and a radiant healthy glow can be seen on the skin surface. 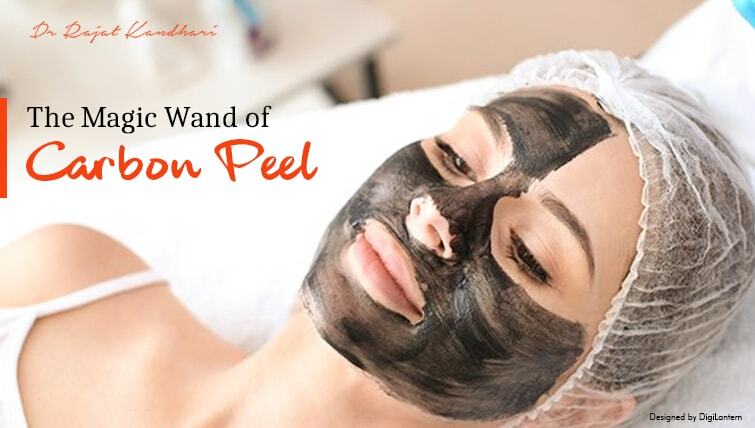 This happens because carbon peeling ensures freedom from dead skin cells, blemishes and open pores. Not only this, as your skin gets deep cleansing, thus outbreak of acne and pimples is also controlled and checked. The skin is also accelerated to produce more collagen and hence the skin looks more plump and voluminous. Carbon peeling has enormous benefits over other treatments. Firstly, it is not gender or skin type specific. Thus anyone, be it male or female can undoubtedly go for this treatment. Moreover, you don’t need to worry about checking your skin type for suitability and portability. Moreover, carbon peeling works on blackheads, oily skin, enlarged pores and dull skin and wrecks havoc upon them resulting in the soft, smooth, radiant and clean skin. There is minimal downtime associated with the procedure and one can attend a party or any other event after the treatment. We at Veya Aesthetics, headed by Dr. Rajat Kandhari provide carbon peeling after thorough assessment of the skin and with a FDA approved device used for the procedure. For details, visit the clinic or call on 9315479193 to book an appointment.